You watch the pros even in slow motion and it looks like everything is perfectly timed, they’re never rushed. Federer is a great example, it’s poetry in motion. But the dark underbelly is, it’s not all that easy to be on time when you hit the ball. I remember after learning the secrets to creating effortless power the actual implementation phase where I was practicing the stuff, and I was late all the time, especially in matches and getting so frustrated because the ball was flying everywhere and there wasn’t a lot of power. Luckily though, in this video I’m going to show you how to rid yourself of that annoying, frustrating tendency of being late and how you can comfortably hit the ball, hard, effortlessly, and look really good doing it. Let’s mosey on up to the court and I’ll show you what I’m talking about. So the ball’s coming to your side of the court, you start to prepare your swing you maybe even start a loop, because you’re working on a modern forehand… and the ball is in on you and you’re handcuffed, you get that T-Rex look when you hit your groundstrokes. the ball then either floats to the other side to get crushed or you miss completely and are red with embarrassment, and probably feeling pretty pitiful. I know how frustrating this is, first hand. Take the Racket back sooner. Which you don’t want to do because it disengages your body from the groundstrokes, which is where your power comes from. Or you may even hear, turn sooner. And that’s a little better, but the question is WHEN? One of the main reasons you’re hitting the ball too late is because you’re preparing too late. The first thing you have to do is become an expert at watching the ball. And I made a video on watching the ball thatI’ll link to in the description… that’s key. Watch it. But assuming you’re watching the ball I’ve got a 2 things that will really help you. The first is, after you come out of your split step… as SOON as you know what side you are going to hit, I want you to say “forehand” if you’re going to hit a forehand, or “backhand” if you’re planning to hit a backhand. Do this either to yourself, or even say it out loud. The reason this works like crazy, is in that split second of when you decide on the stroke, it creates a space… a space for you to begin your stroke. And if you START the stroke early enough, meaning you start turning, rising up into the hit and all of those good things, you’ll have a LOT more time. We get screwed up when we start moving around, tracking the ball but we haven’t begin the stroke. All of a sudden, the ball is in on you, and you haven’t even started the stroke… what results is something out of a tennis horror movie. So don’t do that. Say to yourself “FOREHAND” or “Backhand”… and what will happen is, your subconscious mind will start automatically moving you into position to hit the ball, and you can focus on executing your stroke. The Second thing you can do, is reduce the amount of time you have between shots. One simple way to do this is have your hitting partner stand up at the net and volley back to you. This FORCES you to react faster, to prepare your groundstrokes faster, and to initiate your Stroke FASTER. If you’re like me in this video and you’re working with a ball machine, you can just speed up the interval of feeds to reduce the amount of time you have. The reason this works is the CONTRAST of having less time for your groundstrokes will make it seem like you have all day when your hitting partner moves back to the baseline… but your reaction time will still be fast, so you can begin your stroke, and be on time to meet the ball in front of your body! 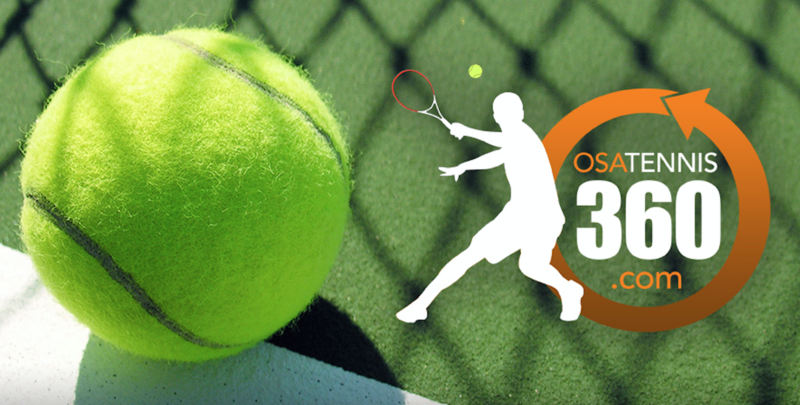 This entry was posted in Osa Tennis 360 HD Video Lessons (New subscribers) and tagged backhand, forehand, groundstroke, groundstroke timing, tennis, tennis backhand, tennis forehand, tennis groundstroke. Bookmark the permalink.